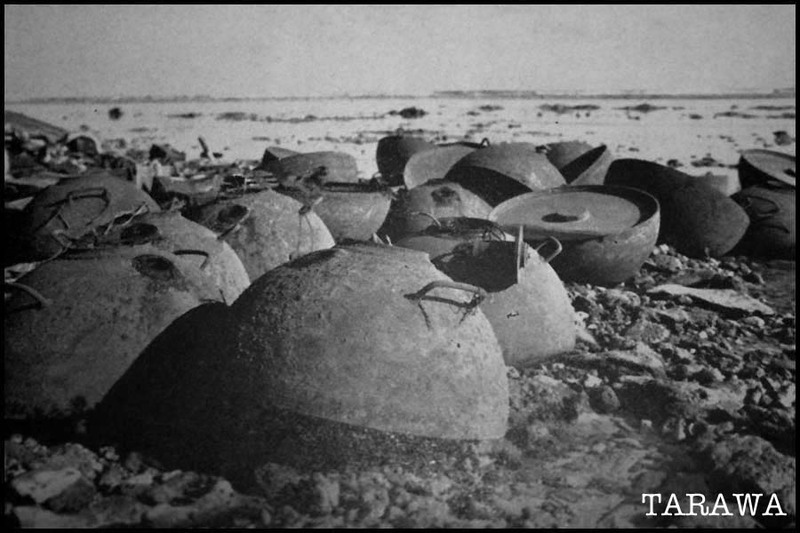 These mines were called "Teapot Mines" or "Kettle Mines" because of their shape. Each contained about 47 pounds of explosive. "Mines -- land mines capable of completely wrecking LVTs and killing all hands aboard were placed in great quantities on GREEN BEACH SOUTH." The Type JE is a hemispherical, chemical-horned, all-welded mine. The outer body forms a hemisphere and has two handles on its upper portion, a central opening on top to take the booster and safety switch, and two horn openings 180 degrees apart. The mine is divided internally into an explosive chamber and a chamber containing booster, wiring, safety switch, and horn electrodes. The division is made by a shallow, saucer-shaped steel section, which forms less than a hemisphere which is pressed into the outer body from the bottom and welded in place. A plate is then fitted into the bottom of the mine and is also welded in place. This last-mentioned plate also carries a filling plug in its center and is inset 13/16 of an inch to allow clearance for the plug. 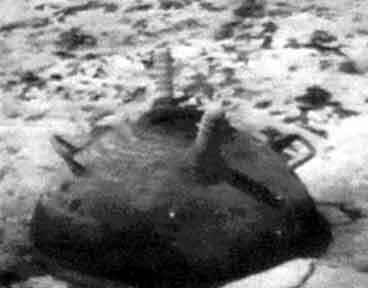 The horns, two in number, appear to be standard lead-acid mine horns. They are set at an angle of about 65 degrees and project above the level of the mine top; threads are left hand. In the firing circuit is a spring-loaded plunger whose upper end projects through.